The biggest Spring allergy trigger is pollen. Trees, grasses, and weeds release these tiny grains into the air. When they get into the nose of someone who is allergic, they send the body's defenses wild. 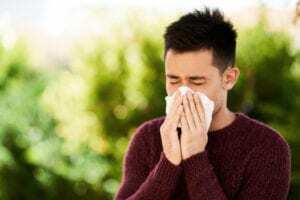 The immune system mistakenly sees the pollen as a threat and releases antibodies that attack the allergens. That leads to the release of chemicals called histamines into the blood. Histamines trigger the runny nose, itchy eyes, and other symptoms. 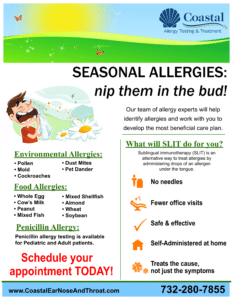 Review our allergy testing hours to find a time that works well for you in our Neptune or Holmdel locations. Call TODAY 732-280-7855!